Jewellery Is There A Mathematically-Proven Ideal Cut For Diamonds? Is There A Mathematically-Proven Ideal Cut For Diamonds? We explore the allure of Lazare Diamonds’ dazzling gems, and why its ideal cut leaves other jewels in the dust. Diamonds, as the popular saying goes, are a girl’s best friend. The sparkling gems have become so embedded in human social consciousness that entire songs have been dedicated to them, and nearly every marital engagement is sealed with a brilliant diamond ring. But what exactly makes a diamond valuable? Is it its weight, calculated by the carat? Is it its clarity—anything less than flawless is a bust? Perhaps, it is a diamond’s colour that justifies its price tag—the infamous Hope Diamond is certainly famous for its deep blue hue. Or is it a diamond’s cut that determines its fate? According to the Gemological Institute of America (GIA), which is recognised around the world as the premier resource of gem and jewellery information, that is indeed the case. “Cut quality is the factor that fuels a diamond’s fire, sparkle and brilliance,” advises the GIA, and “the allure and beauty of a particular diamond depends more on cut quality than anything else”. We speak to Charles Rosario, the senior vice president of Lazare Diamonds, on why he considers the Lazare ideal cut diamond superior to every other diamond cut on the market. Rosario has worked in almost every job available at Lazare, from stock room diamond sorter to diamond grader and polisher, and now as senior vice president, so there is likely no better evangelist for Lazare's diamonds. What makes the ideal cut ideal? Well, how do you measure light reflection in a diamond? It has an internal reflection, so if you cut it at certain angles, you can direct the light, like in a prism. The theory is if you cut a diamond to specific angles and proportions, you can control the way the light reflects within the stone, and make it such that the light bounces up through the top of the stone. That reflection is what gives a diamond its brilliance, because you always look at a diamond from the top. The more sparkle and brilliance from the top, the brighter and more beautiful the diamond. In 1919, our company’s founder, Mr Lazare Kaplan, came across this theory of internal reflection and decided to test it. He cut the diamond and he found it to be correct—it was a more beautiful diamond than anyone had ever cut in the history of mankind. What’s really cool is that with today’s technology and the way that we can measure reflection and refraction, it’s been scientifically proven that his original concept of the ideal cut was correct. Other companies have “ideal cuts”. How are these different from the Lazare ideal cut? If ideal is a target, the Lazare ideal cut is the bullseye. It’s important to know that it’s not just the ideal cut, it’s the original ideal cut. It’s the best way to get the maximum brilliance and beauty from any diamond. Of course, the more beautiful the diamond, the more people would pay for it. When other companies realised this, that’s when “ideal cut” started becoming a more popular term. But in terms of consistency, always getting the maximum brilliance, and getting every single diamond the same, it’s Lazare. That’s what makes us special. If it is a mathematically proven cut, why are more companies not cutting diamonds this way? Technically, anybody can do it if they have the right skills. It all depends on whether they have the right desire. Because when you cut diamonds to the original Lazare ideal cut, you wind up with a smaller diamond, which not everybody likes. However, if you cut it according to the Lazare ideal, you can get the maximum brilliance from that diamond, and it’ll be more beautiful than a diamond that isn’t cut that way, even if that other diamond is larger. In the four Cs of diamond grading—colour, carat, clarity and cut—Mother Nature covers three of them. Only man controls cut, and that’s the only way for man to add value to a diamond. That’s what we do at Lazare. Despite all the talk about the importance of quality diamonds, they would be useless without the right girl to befriend. If you do want to get closer to these dazzling diamonds, there is only one place to go. In Singapore, Larry Jewelry is the sole distributor of Lazare Diamonds, retailing both Lazare’s house-designed jewellery and using the brilliant gems in its own creations. Their creations are classic and withstand the test of time. We could most definitely see the Lazare diamond jewellery being worn and appreciated for generations to come. Diamonds, after all, are forever. 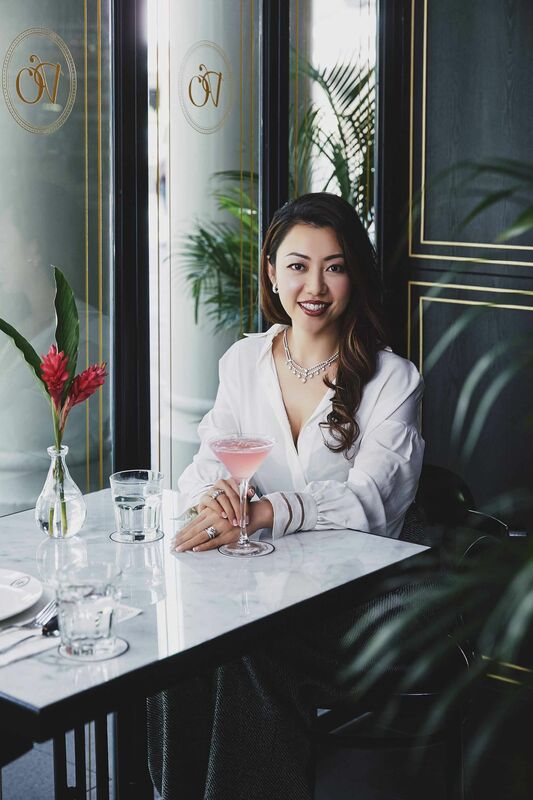 We spoke to Sandy Lai, one of Larry Jewelry’s longtime customers, to find out why she is such a huge fan of Lazare diamonds. Having grown up watching her mum wear spectacular jewellery, Sandy became a discerning diamond connoisseur herself, and wishes to pass on that love to her young daughter, Chelsea. Which Louis Vuitton Heirloom Piece Is Angela Ng Gifting Her Daughter Adeline Teo? Tell us how you came to like diamond jewellery. My mum is a very simple woman, and she’s usually dressed down. But whenever she would go for dinners, she always made sure that she put on her jewellery. I grew up watching her wear stunning pieces, and she passed on that love of jewellery to me. She made sure that I had my ears pierced before I was a year old, and she gave us diamond studs the moment we turned 10. And the size of the studs just got larger the older I got! How did you become a fan of Larry Jewelry and Lazare Diamonds? I’m very particular about my diamonds. Ten years ago, I was out shopping with a friend and she recommended that we go to Larry Jewelry. We were served by Eric, one of Larry Jewelry’s longest serving staff. I was a little hesitant at first, but Larry Jewelry really had that personal touch—the staff educated me about Lazare diamonds and what made them special. I was already quite knowledgeable about diamonds, and I was amazed when I saw a Lazare diamond for the first time. The sparkle and brilliance was just breathtaking. When I compared it to diamonds from other boutiques, I could see that Lazare beat them easily. And I slowly fell in love. I bought one piece after another, and since then, it’s been only Lazare diamonds for me. These days, women don’t have to wait for their loved ones to buy them jewellery—they can buy it for themselves. Do you agree? Yes, of course. I started buying jewellery over 10 years ago, even before I met my husband. I really love jewellery, and I like that Larry Jewelry has such a wide selection of pieces for all occasions. Plus, I know that I can trust them. They never push me to buy jewellery for the sake of it, and instead always recommend pieces based on my needs. What do you look for when buying jewellery? The quality and the setting. I feel that the setting sets the mood for the day, and it shows off the wearer’s personality. I wear diamonds every day, whether it’s earrings, bracelets, or a statement piece, because they’re very versatile and I love them. What lessons about jewellery would you like to impart to your daughter, Chelsea? She’s about 17 months old right now. I’ve already bought diamonds for her, but I haven’t pierced her ears yet—I want her to decide for herself whether or not she wants to do so. If she sees me wearing diamonds and wants to emulate me, then all the better! I want to teach her to appreciate quality jewellery, and not to buy pieces for the sake of it. Jewellery should last a lifetime. That’s why I personally always buy pieces that I can pass down to her one day. I hope that she’ll pass that lesson down to her children as well.